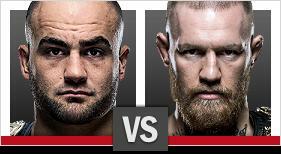 The UFC and NeuLion are streaming UFC 205 “super fight” between Eddie Alvarez and Conor McGregor in HD or 4K to fans worldwide for the lightweight title. This live pay-per-view (PPV) championship tripleheader event is the first mixed martial arts (MMA) event held in New York ever. The Madison Square Garden Octagon on Saturday, November 12 will be full of 20,000 fight night seat holders while millions of fans will be streaming the fights over the Internet. NeuLion, UFC and Sony have teamed up to capture this epic live sports event in 4K tech and then stream it from MSG live on SONY 4K Ultra HD 2015 and 2016 TV models in every country except China with the purchase of the PPV HD package. The Sports Techie community blog caught up with Chris Wagner, Executive Vice President at NeuLion, about the historic UFC debut in New York City powered by their company and what it means to their business and to the sport industry. The 4K broadcast over the web can be watched by fans that purchase a digital pay-per-view ticket for $59.99, available on any internet-connected device via the highest streaming quality of 60 frames-per-second, at an average of 18 megabits, making the video 4-times the detail of full HD. UFC 205: Eddie Alvarez vs Conor McGregor – Main Event Preview. The World’s Most Famous Arena is host to the Alvarez vs. McGregor PPV event billed as the “biggest, baddest” in league history. The fact that last April, the MMA was finally legalized in NY has driven the ticket market to Super Bowl type pricing. Ringside seats can be had on the secondary market in upwards of $8,000. Upper levels seats range from $4,000 while a single nosebleed seat is selling for $1,500. The best athletes in the world are involved at UFC 205 with three UFC title fights of the 13 in total. Lightweight champion Eddie Alvarez puts the 155-pound title on the line against surging featherweight champion Conor McGregor, who’s out to dominate a second division. Welterweight champion Tyron Woodley takes on Stephen “Wonderboy” Thompson and strawweight queen Joanna Jedrzejczyk faces fellow undefeated Polish striker Karolina Kowalkiewicz. For Sony Ultra HD TV buyers – they are eligible to watch the event in 4K live streaming. This is available on all SONY 4K Ultra HD 2015 and 2016 TV models in all countries except China. 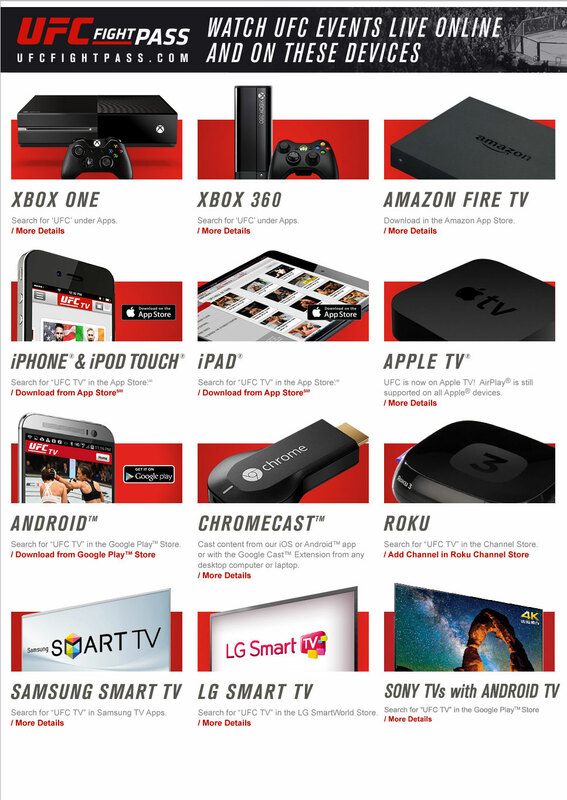 Fans with a 2015 and/or 2016 Sony HDR Ultra HD television, set nearly anywhere in the world who have downloaded the UFC app from Google Play, will also be able to watch UFC® 206, set for Saturday, December 10 in Toronto, Ontario, Canada, in 4K. UFC 205 At MSG Powered By NeuLion Streamed On Sony 4K Ultra HD TV – SportsTechie blog. 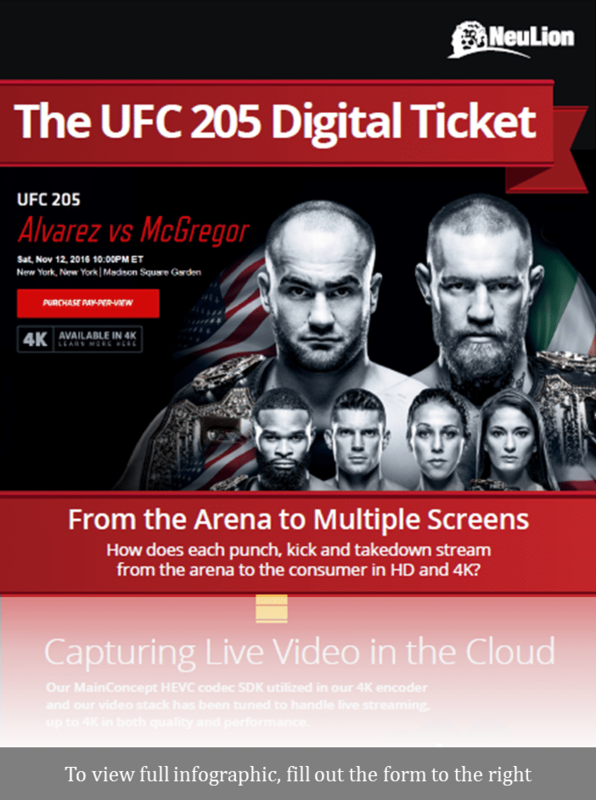 NeuLion powers UFC.TV and will be delivering the “UFC 205 digital ticket”, which will offer fans live and on-demand PPV access to all of the UFC action, on every leading internet connect device in up to 4K technology. UFC subscribers can access the high-quality live OTT video feed of UFC 205 in HD and 4K via NeuLion-powered multi-screen apps. UFC 205 is not offered in Fight Pass which is subscription based. Fight Pass currently has a special 6 month offering that allows access to the MMA library loaded with hundreds of archived UFC fights, as well as behind the scenes footage, at a cost of about $9 per month. There is a free FightPass 7-day trial too. How does each punch, kick and take down stream from the arena to the consumer in HD and 4K? UFC subscribers can access the high-quality live video feed of UFC 205 in HD and 4K via NeuLion-powered multi-screen apps. NeuLion, Inc. (TSX: NLN), is a leading technology product and service provider that specializes in the digital video broadcasting, distribution and monetization of live and on-demand content to Internet-enabled devices. The NeuLion Digital Platform is an end-to-end platform facilitating the streaming of high-quality content up to 4K, for premium sports and entertainment brand worldwide including the NFL, NBA, UFC, WSL, Univision, Tribeca and others. Editors at the NeuLion Operation Center create instant highlights and event markers for a personalized fan experience. NeuLion video experts use proprietary tools and expertise to ensure the highest video and data quality. 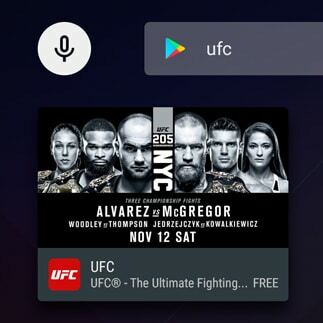 UFC can monetize content using any combination of business models to deliver multiple services within a single unified experience and unlock additional revenues. NeuLion tech tools and experts constantly monitor in real-time the video source, quality of service, and CDN and server performance for optimal playback. Their 4K encoder at the venue utilizes NeuLion technology to deliver using the NeuLion Digital Platform, 4K encoder and the NeuLion CE SDK a stream into the cloud with a high bitrate without dropping any packets. Other 3rd party encoders have challenges in handling the 4K stream and many other vendors are trying to reduce the bitrate which impacts the quality and experience. With industry-leading encryption, NeuLion technology ensures secure video streams for UFC viewers. The NeuLion MainConcept HEVC codec SDK utilized in their 4K encoder and video stack has been tuned to handle live streaming, up to 4K in both quality and performance. The 4K technology is based on a year long R&D effort and new development, plus many field tests to give them the best result for live 4K delivery. The NeuLion CE SDK is the premier solution for CE manufacturers to quickly add support for HEVC high frame rate streaming (up to 4Kp60) using HEVC MPEG DASH. That is four times the quality of HD. The 4K market continues to grow as more and more people buy 4K TV sets. IHS predicts penetration of US households who will own at least one 4K TV set will rise quickly, hitting 34% by 2019, representing about 34 million homes. With this, the availability of 4K content will also continue to rise and live sports proves to be the most compelling and engaging in the higher quality. Wagner says a new 4K TV costs ab average of $800 to $1,500. Consumers love watching Amazon and Netflix movies on the crystal clear screens as well as live sports and entertainment. NEULION TO DELIVER HISTORIC UFC® 205: ALVAREZ vs. McGREGOR IN 4K OVER THE TOP. Sports Techie, I have attended one UFC event in Seattle and was impressed by the fighters talent levels, the business focus on enhancing fan experiences, and the importance technology plays overall in everything from production, to broadcasting, to mobile devices. Wagner himself will not be at the UFC 205 event but is pumped to watch the live NeuLion stream on his 65-inch Sony 4K Ultra HD TV set from home like many fans around the world. He said, ‘The UK offers 4K over satellite.” For the first time Wagner is aware of, “NeuLion is steaming live sports globally in 4k behind a paywall ” he added. NeuLion technologies scales the video stream from 6 megabits to 18 megabits, three times the size, and then plays it out. The resulting video on public TV sets needs to be in the same quality as the original stream even if it is 30 to 40 percent more. The intial 60 f.p.s. video captured from UFC 205 is compression by NeuLion, shipped across the web to televisions, unwrapped, and then played in its original format. Sony has a deal in place to license this tech into their 4k player installed on smart TVs. NeuLion sees accelerating momentum with its partners such as this UFC service to deliver the best fan experience with 4K as a new core competency. Watching UFC 205 in 4K or HD is almost like being inside the Octagon at MSG in person thanks to NeuLion.